We offer a fascinating and trendy range of stainless steel bar tool sets, which is exclusively designed and is available in a variety of enthralling designs. These bar tools set serve as a perfect gift option to your relatives and friends, who quest and appreciate the best. Our range includes cocktail shaker, bullet cocktail shaker, deluxe cocktail shaker, regular cocktail shaker, cocktail shaker set, bowling alley cocktail shaker, bar tray, steel cocktail shaker, stainless steel cocktail shaker, steel bar tray, stainless steel bar tray, stainless steel bar shaker, bar cocktail shaker, stainless steel barware shakers, stainless steel beverage shaker, stainless steel wine shaker, stainless steel vodka shaker etc. Roll your arms, aim the measured spirits and roll the ice along it's stainless steel mirrored surface. 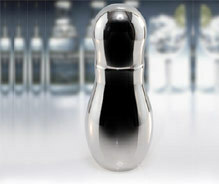 These bowling alley cocktail shakers are sure to bowl you over and help you score a perfect ten ! Shake one and shake all. 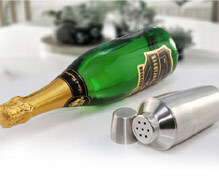 These deluxe cocktail shakers provide a comfortable grip to the spirited efforts of the shakers, thereby offering a perfect blend of the proven as well as adventurous spirits. 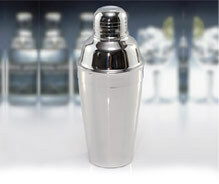 Shake well, for this flask shaped regular cocktail shakers provide a perfect blend of spirits. A must among bar ware collection, their innovative shapes add up to provide a strong & smooth grip for shaking up the evening into a party mode. 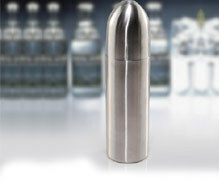 The innovative designs of these bullet shaped cocktail shakers provide the needed shake and boost to ease in the laughter in conversation and set the dice rooling. 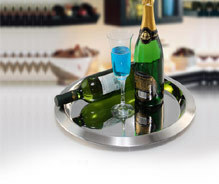 Perfect round stainless steel finish with slightly raised borders make these bar trays steadily hold the bubbling glassed spirits and the still hot biting while making trips around the happening conversations. 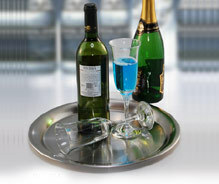 Mirrored base finish and aesthetically designed side barricades is what these bar trays provide to the party lovers, steadily moving the drinks and bitings from table to table. 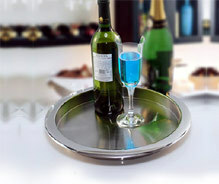 Let the carried spirits and the smiling face get reflected on these mirror finished stainless steel bar trays. Their innovative designing also help in reaching the far off tables with equal grace.